with not one, not two, but three projects! hearts from one of the patterned papers as well! decorative edge and folded at 1/2″ increments. Glue the ends together and fan into a circle. 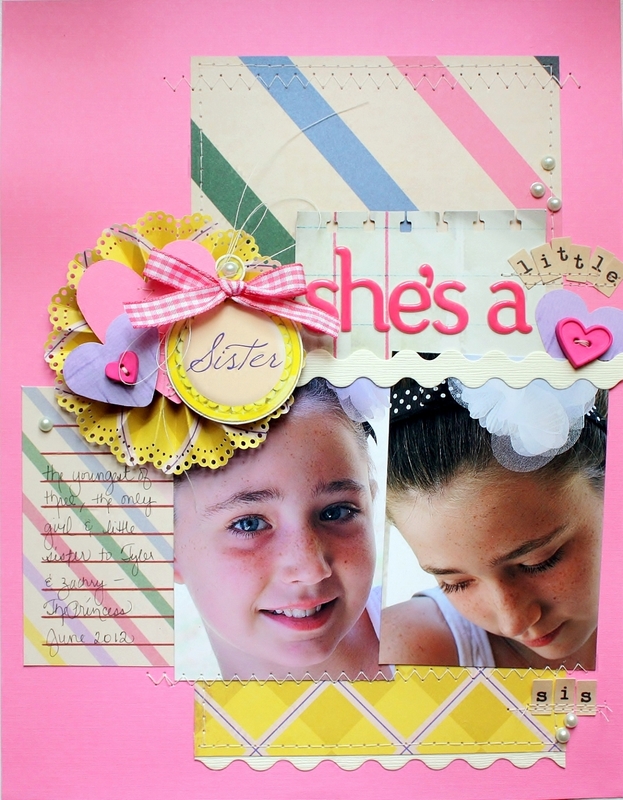 Glue to the top of a 2″ circle and place something heavy on top until the glue has dried. Vintage Street Market paper is the perfect weight for creating these fun embellishments. a handmade card hehehe…her expectation I could not let down! Once again you see that I’ve created a pleated embellishment. the vacuuming woman from one of the pages! Finally…and I LOVE this…is my Patriotic-decked-out-BINGO-card-hanger! I have a small wired dress form on the side of my craft desk. it adds a little happiness to my clutter and makes me smile. 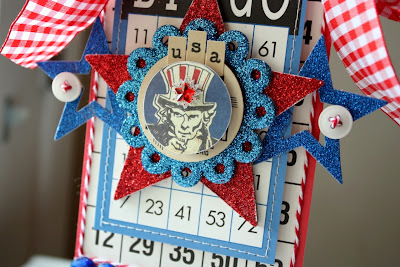 And I have to admit, Vintage Street Market BINGO Craft Cards are my favorite product. 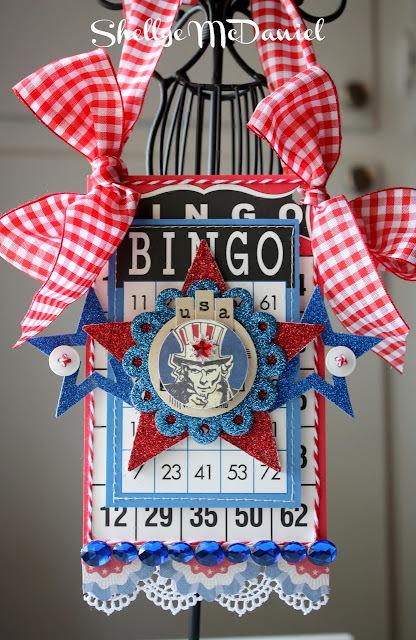 it with a glittered scalloped circle, vintage milk cap and patriotic embellishments. The perimeter of the red card was lined out in Red Twirly Twine. See you all in a couple of days...glad you've stopped by! These are all amazing. LOVE the bright colours! 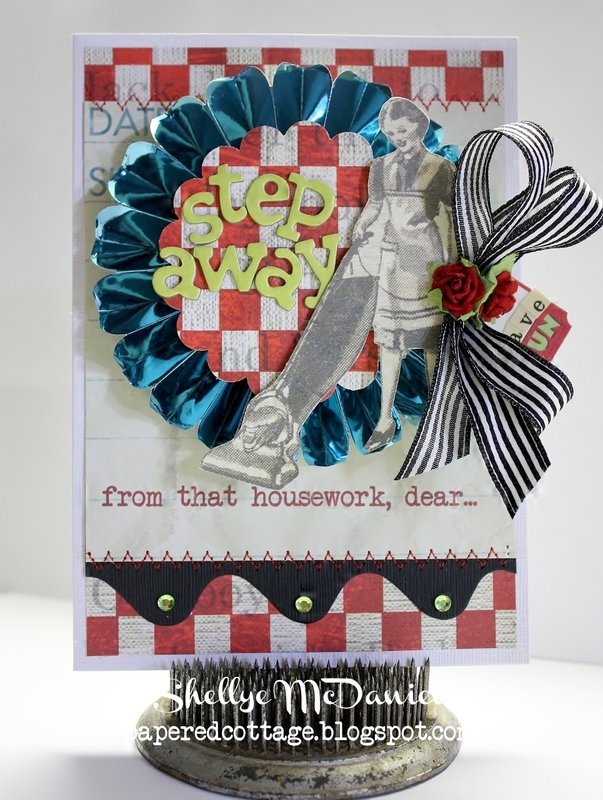 so amazing love the one that says step away from the housework dear.. Love it! sooooo cute!!!! love all the layers and textures! !